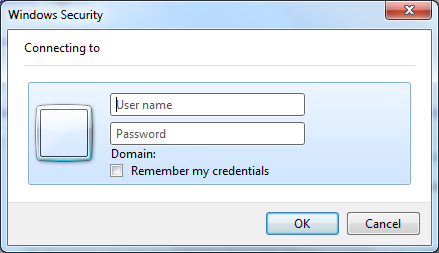 It can happen that you have a need to automate tests via CodedUI on Web Sites that do use Windows authentication. This means that no login forms will be presented and your browser, by default, will pass the currently logged in user credentials to the IIS. This is not handy when it comes to automated tests, as for sure, you are planning to use a specific user to run your tests and not the one that is running the test agent services. 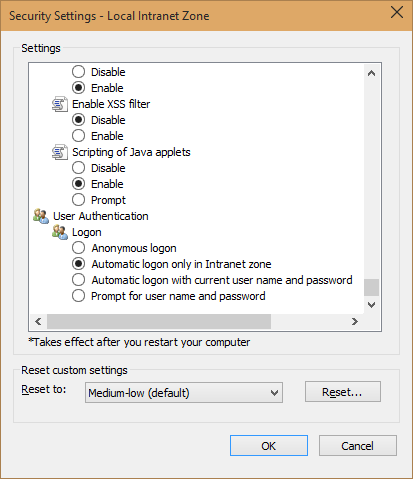 Once you scroll to the bottom you will find the settings in question under User authentication -> Logon. By default, it is set to “Automatic logon only in intranet zone”. If we change it to “Prompt for user name and password” you will see that once we now reopen our site, a request to insert our credentials will be presented. In this way we can login wit a different user than the one we are logged in on this system. Note that in some cases this settings can be disabled by a Group Policy. This is often the case in the larger organizations. This is very handy and let’s see how to achieve this via our CodedUI test. Instead of using the interface, we are going to try to set this option through the registry. This is quite handy as it can also bypass the group Policy restriction in case we do have sufficient rights. After some Googling I came across the following page Internet Explorer security zones registry entries for advanced users. 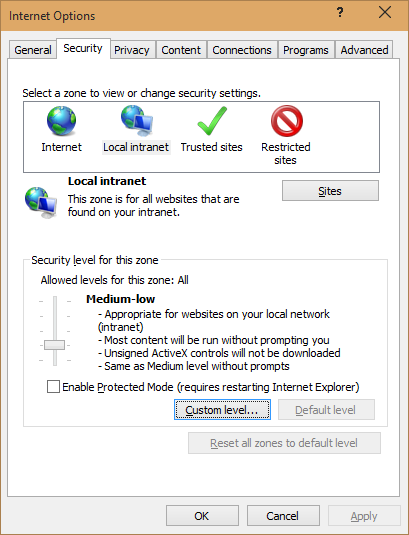 As you can see from the title it enlists all of the settable options for Internet Explorer security zones via the registry entries. In between others there is the one we are interested to, precisely, “1A00 User Authentication: Logon”. Our task is now clear, we need to open the key SoftwareMicrosoftWindowsCurrentVersionInternet SettingsZones1 under the Current User hive and change the value of 1A00 setting. Let’s write some code that will help us with that. /// Gets a key-level node in the registry regarding the ID Local Intranet Zone settings. To follow are the methods that will allow me to retrieve and set the correct logon settings. In order to have a cleaner and more precise overview over the possible options, I am going to create and use an enumeration in order to manipulate them. I will call my enumeration LogonSetting and it will list all of the accepted values. All of the necessary information came from the MSDN document I previously mentioned. Plus I added a NotSet value for the cases in which the value 1A00 doesn’t exists, which is plausible in certain cases. /// Sets the IE Logon setting to the desired value. /// The desired value to assign to the Logon Setting. /// Retrieves the current IE Logon setting. This is all of the necessary code that we need to comfortably interact with this settings. You can note that we are using an extra state in our enumerator that indicates the value not being set at all. If that is the case, once we are setting the value, we need to eventually remove it from the registry. Once we start laying down our CodedUI test code we need to choose what strategy we are going to adopt for preforming our task of changing the IE setting. There are couple of places in which we can do that, more precisely three events we can consider for this task. CoudedUI put’s on our disposition three attributes that we can use to trigger the execution of our code at certain, predetermined moment. This attributes are respectively TestInitialize, ClassInitialize and AssemblyInitialize. You can read more about this attributes at the following page Anatomy of a Unit Test. As most of you probably already came across this attributes I will not get in the details about them and I will pick the TestInitialize which runs given code before the run of each test. Based on your situation you may prefer to perform this only once per assembly or at the class level. The choice is yours and the implementation may vary based on your needs. Retrieve the current value of this setting, so that we can restore it once the test is done. Change the setting to the desire state. As you can see we are persisting the original value inside a variable on the class level by using our previously created method GetLogonSettings() then checking if perhaps it is already set to our desired value (so that we may be do not need to change it) and if not we are using our SetLogonSettings() method to set it to the desired value. Now our browser will be set to always prompt for user name and password. The next thing is to restore the original condition. We are going to use the antagonistic attribute to TestInitialize which is called TestCleanup. Again, we check if the desired setting is not our original setting (and in that case we do not need to do nothing), otherwise we set our setting to the original value. 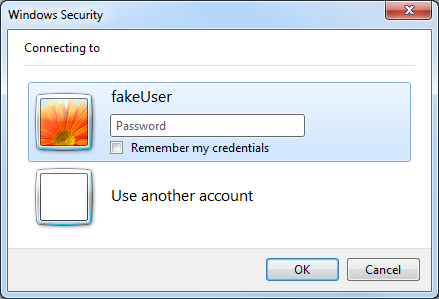 In the following paragraph we will see on how this works and how to authenticate via the Windows Security window. In order to intercept the Windows Security window, with whom we are going to interact and automatically provide the credentials, we need to declare it in the way that CodedUI can recognize it and map the elements we are going to interact with. To be clear which window we are speaking about, here is a picture of it. This is the window that will be presented once the IE is asked to provide the credentials. With the following code we will declare this window so that CodedUI is able to recognize it. And insert the credentials as in the ordinary case (luckily element names are always called the same). What remains is to recall it in the following way and pass in the desired credentials. We saw all the pieces of the puzzle. Now let’s see how to prepare the IE, start it and authenticate. In the bottom of this post you will find a link where you can download my example project. There is an ASP.NET web site which uses Windows Authentication and relative CodedUI project which executes the test. In this way you can have the complete picture. As you can see, we are launching the browser window and pointing it to our application (make sure IIS Express is running before you do execute your test) and just specifying our WindowsSecurityWindow object. After that authenticate will kick in and all the actions will be performed as expected. Thanks to the code we wrote earlier, the browser will request the credentials to be provided and it will not try to login with our current user. 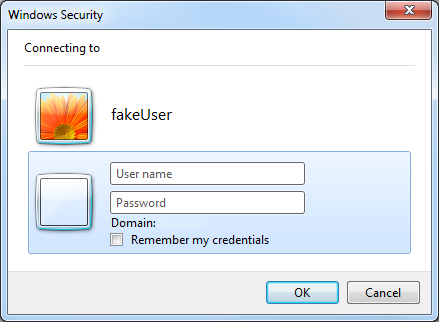 Note: In order this example to work, with IIS Express, you will need to enable windows authentication for IIS Express. In order to enable windows authentication in IIS express open the file called applicationhost.config which is located in My DocumentsIISExpressconfig which again translated in my case is C:UsersMaiODocumentsIISExpressconfig. Once you open this file for edit and search the “windowsAuthentication enabled” string. You will land on the right spot. By default, this element is set to false. Just set it to true and you are ready to go. This is an abstract of the final state of applicationhost.config. One more thing, make sure that you create an user that you are going to use to test this scenario. Open the computer management and create a dummy user (in my case called test with a strong password equaling to test). Last thing to do is to change the application web config with the right user and update the user name and credentials into your test. You can now open your Test Explorer and hit run! You should see IE starting and pointing to your application page, authentication window popping out, credentials being passed and finally you are logged in! I hope you enjoyed reading this article and that you fancy the neat technique of managing the windows authentication. In this way you do not need to pre-prepare your clients on which you are going to execute your tests and more important you do not need to mess up wit the Credential Manager. Stay tuned for more articles about CodedUI and testing automation. First if all Thank a lot for your wonderful Article. Keep posting. Even I faced the same issue and at last found a solution and resolved it but the actual problem started after this. When I try to find a control from the opened window, error t “You do not have sufficient privileges to access the information about this control or the control is part of the recorder process” is thrown, adding to this I couldn’t able to spy the objects in this particular browser window using Coded UI Test builder also. Can you please help me on this. I’m using a web based application and I need to run IE as different user to support my test. I do not know why are you experiencing that behavior. The only thing I can add is that this technique will not work on machines that do use language that is not English. May this be your case? I have a question, My coded UI project works for IE,Chrome, and Firefox. I’m wondering how to handle this in Chrome and Fireforx. I have automated the above scenario but the password field I don’t want to show in code. Is there any alternative for this?